Scrumptious Apple Crumble Pie – The BEST apple pie I’ve ever eaten is so easy to make at home! You’ll love the crumble topping. (Gluten Free & Dairy Free Friendly). Scroll down for the FULL RECIPE! Photos + post updated October 2018. Originally posted June 2008. For several years at the start of our marriage, I was on a homemade apple pie recipe quest. I’d tried all sorts of apple pies over the years, but just hadn’t landed on that perfect apple pie. I wanted something memorable, special, with a full-to-bursting apple filling, and just the right blend of flavors. After LOTS of trial and error, we landed on this one. It’s the perfect homemade apple pie recipe. THE apple pie recipe. Michael turned to me mid-bite the first time I made it and said “when our kids talk about Mom’s apple pie, THIS is the pie they’re going to mean.” I think he’s absolutely right. Two words, friends: crumble topping. 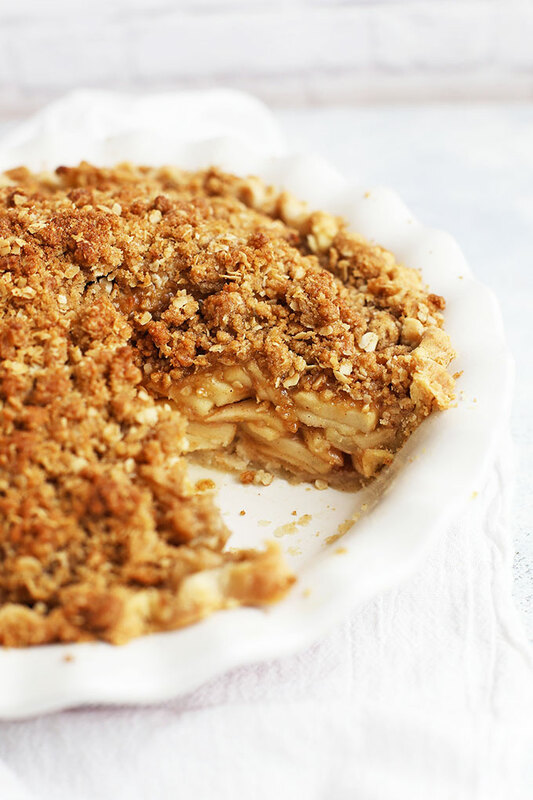 The Amazing Crumble Topping – It’s like the best parts of apple crumble and apple pie mixed together. Buttery, brown sugary goodness with flecks of oatmeal. I feel like I don’t need to say more than that. It’s SO GOOD. A Piled-High Apple Filling – I’ve had a lot of bland apple pies in my life, and lots of them didn’t have quite enough apples in them. This pie…doesn’t have that problem. It’s definitely the largest apple pie I’ve ever made, and that’s because it starts with a mile-high apple pie filling. 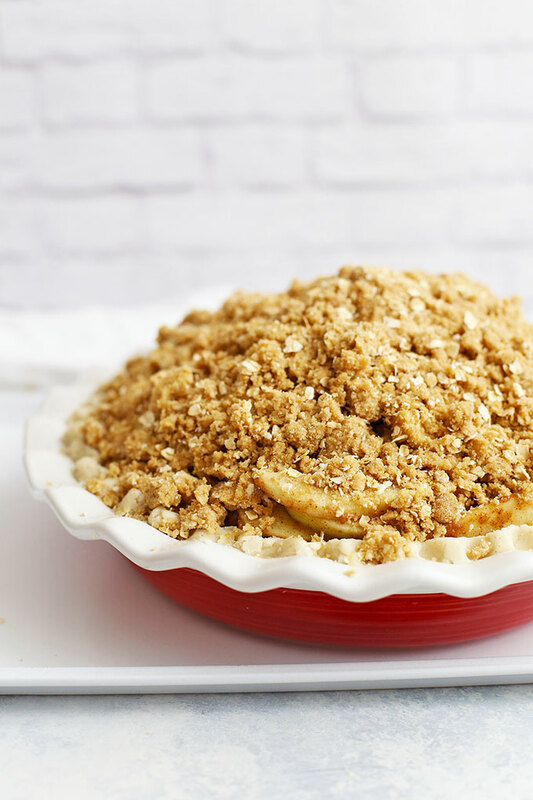 Thin slices of apples laced with cinnamon and vanilla, piled high on your favorite crust means you’re getting plenty of apples in this apple crumble pie recipe. It’s Friends With Add-Ons – What do I mean by add-ons? Vanilla ice cream or caramel sauce. 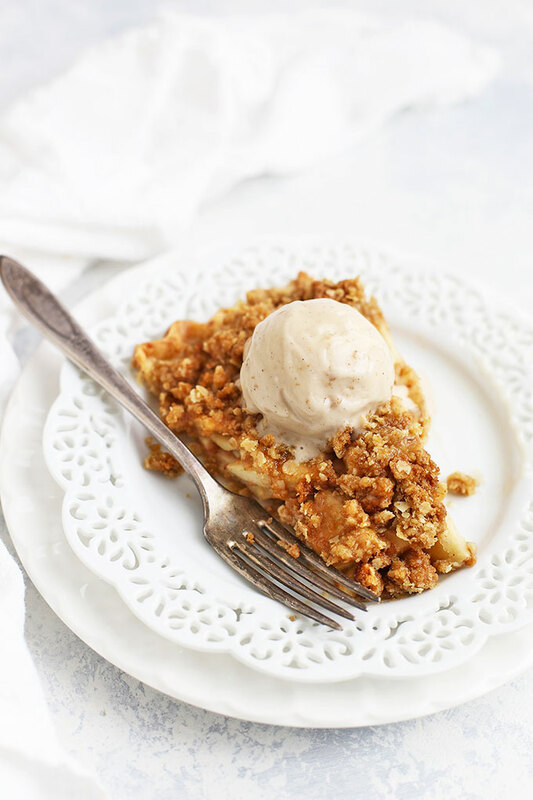 Whether you’re spooning over dairy free ice cream or the dairy stuff, this apple crumble pie plays well with vanilla ice cream. And a little caramel sauce on top? Fuhgettabouit. The Recipe is Gluten Free & Dairy Free Friendly. You can make this straight up with regular white flour and butter. Or, you can make it with gluten free flour and vegan butter. The choice is yours! Just pick your favorite crust. This is my favorite gluten free crust recipe, and this is my favorite white flour pie crust recipe. Which Apples Are Best for Apple Pie? Granny Smith – A little tart, these hold their shape well. Honeycrisp – My all-around favorite apple. It’s good for everything! Jazz – A friend of the honeycrisp, these are easier and easier to find. Golden Delicious – Mild, sweet and a little softer, these are good with higher spiced pies. Pink Lady – One of my favorites for munching, this tart-sweet apple is great for baking. Jonagold – Jonagold are a cross between Jonathan + Golden Delicious. Braeburn – Lots of folks think these have a slightly citrus-y taste to them. Really good! Northern Spy – Harder to find outside of the New England area, but a big win when you can! MacIntosh – These are EXCELLENT for applesauce, but disintegrate for pie. Cortland – Same. Great for applesauce or eating, not as good for holding their shape in pie. 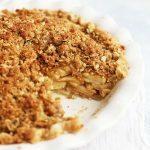 For this pie, I most often use Granny Smith apples since they’re easy to find and the tartness is so nice with the super sweet crumble topping. It’s also really nice to combine a few different pie-friendly apples to get a more interesting flavor. Use what you like and what you can find! Let’s Talk Crust: You can make this the “regular” way (using traditional crust and white flour) or gluten free (see below for substitutions). This is my favorite traditional homemade pie crust recipe and this is my favorite gluten free pie crust recipe (there’s even a video tutorial!). You can also totally use store-bought crust if you prefer. You do you! Gluten & Dairy Free Notes: As I said, this pie can be made gluten & dairy free. You start with a gluten free crust (store-bought or homemade), and use gluten free 1:1 all-purpose flour for the pie/crumble topping. I like Bob’s Red Mill blend. For dairy free, swap in vegan buttery sticks (like Earth Balance) in place of the butter. Make it Ahead! You can totally make and assemble this pie ahead of time, which is a great way to free up time on Thanksgiving or for parties. Make and assemble the pie all the way (crust + filling + crumble topping), then place on a baking sheet and freeze till solid (this is called flash freezing). Cover with plastic wrap and foil or a freezer safe bag, and you can store it in the freezer for about a month. To Bake From Frozen, remove the plastic wrap and foil. Then, place on a baking sheet, and place the frozen pie in a cold oven. (Don’t pre-heat it. Putting a frozen pie in a hot oven can cause a glass or ceramic pie pan to freak out and burst). Set the oven to 350 degrees, then bake for 45-50 minutes, or until the topping is golden and the filling is bubbly. 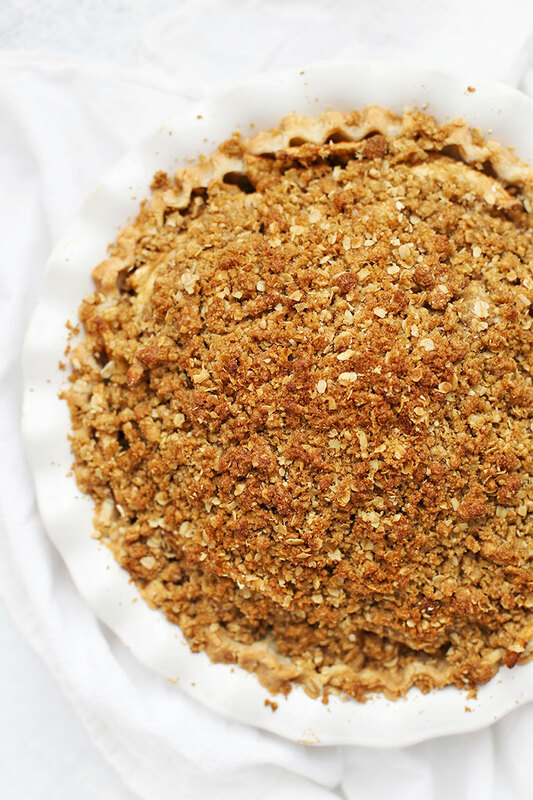 Scrumptious Apple Crumble Pie – The BEST apple pie I’ve ever eaten is so easy to make at home! You’ll love the crumble topping. AND it’s gluten free and dairy free friendly! Note: Nutrition facts are for filling and crumble topping only, as nutrition facts will vary based on the crust you use. Place your crust in your pie pan. Place pie pan on a baking sheet. Make pie filling. In a large bowl, by combining apples, flour, sugar, cinnamon, vanilla, and salt. Pour into pie shell and shake a bit to let the apples settle. Make the crumble topping. In a medium bowl, combine brown sugar, butter, oats, flour, and salt until well mixed and small crumbles form. Carefully scoop or spoon the crumble topping over the apple pie. Bake the pie at 350 degrees for 45-55 minutes, or until topping and crust is golden and the filling is bubbling. Allow to cool completely before cutting and serving. NOTE: Check your pie at the 30 minute mark and again at the 45 minute mark to check for browning. If your crust is browning too quickly, you can carefully tent the crust with strips of foil, or move the pie to a lower rack in the oven. Serve with vanilla ice cream and caramel sauce, if desired. To Bake From Frozen, remove the plastic wrap and foil, place on a baking sheet, and place the frozen pie in a cold oven. (Don’t pre-heat it. Putting a frozen pie in a hot oven can cause a glass or ceramic pie pan to freak out and burst). Set the oven to 350 degrees and bake for 45-50 minutes, or until the topping is golden and the filling is bubbly. Best Apples For Pie – This changes all the time as new varieties of apples come out, but some of the best apples for apple pie are: Granny Smith, Honeycrisp, Jazz, Golden Delicious, Pink Lady, Jonagold, Braeburn, and Northern Spy. I have STRUGGLED with pie crust for AGES and yours is perfection. My husband won’t stop raving about this pie!!! Thank-you for a great recipe that will go in my permanent repertoire!!! Do you guys have a twitter for your site??? I posted a picture of my pie and want to tweet you!! Can you tell I’m super excited?!?!? 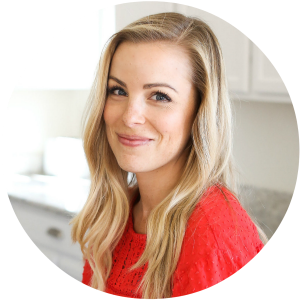 Jessica – That’s EXACTLY how I felt before I started using this recipe! I’m so glad it worked for you. We DO have a twitter account. it’s here: https://twitter.com/onelovelylife Can’t wait to see your picture! I just want you to know that I used this recipe for Thanksgiving last year and it was a huge hit! My husband loved it so much that he asked me to make it for his birthday cake…yeah it’s THAT good 🙂 All of your recipes are delicious!!! I made this recipe last night to have with lunch today and just wanted to say thanks for sharing. It looks and smells incredible! For any other UK peeps wanting to make this, you need to buy trex (don’t use lard as that’s pigs fat, not vege fat). I got mine at Tesco and its next to the butter in a white box with blue writing. Thanks for sharing! I have heard some oats have gluten residue. What kind do you have? You need to look for certified gluten free oats. Bob’s Red Mill & Trader Joe’s brands are my favorite! Oh my this looks great, but just found this after already buying a pre-made GF/Vegan pie crust, which is frozen. Do I need to thaw the crust before I put in the filling or can I fill while frozen and then put in the oven? Suggestions? Next time will try making your crust and am so excited to make your crumble topping. Thanks for any help. You can TOTALLY use a pre-made GF crust! If it’s in a metal foil container, there’s no need to thaw it beforehand. Just add your filling to the frozen pie crust and pop it in the oven! 🙂 I hope you love it!! !